Removing the soup bones from my slow cooker this morning, they were melting apart. Had to scoop them out with a slotted spoon. The meat glistened with tender silkiness. It was still early, but I had to try a bite: Just like the melt-in-your-mouth, slow cooked lamb shanks I’ve had in good restaurants. So this is how those good chefs transform the toughest cuts into the tenderest and most flavorful dishes. I’ve known the rule for years: low and slow. But in my hurry up world, I tried to do low on a gas stovetop that was calibrated for hot, fast cooking. My last batch of soup bones came out as tough as leather, even though I had cooked them on low. Of course it probably didn’t help that I “got things going a little” by bringing the water to boil over high before turning it down to simmer. And then I left it to simmer on the turbo-burner, not the wimpy simmer burner. I was in a hurry, you see. I’d decided at the last minute that the cool day would be a nice one for a last beef stew before summer’s heat settled in. Thankfully, we’re having yet one more “last” cool spell before summer. But yesterday morning I heard about the weather blowing in. So I promptly pulled the last package of soup bones from the freezer and let it thaw all day. Last night I dumped the bones into my slow cooker, filled it with cold filtered water, put on the lid and turned the heat to low. Then the truly low heat (with no advance boiling) and the truly long time (12 hours) worked it’s magic. 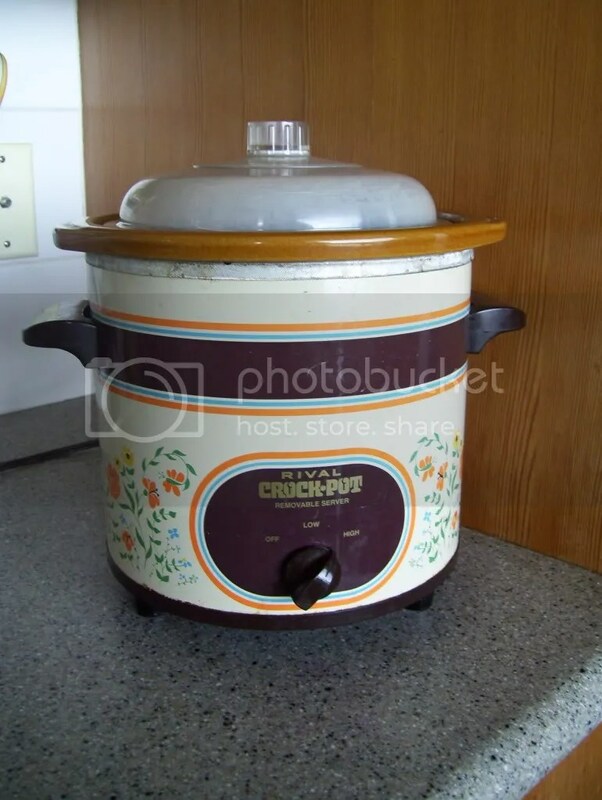 Guess there’s something to be said for forethought and patience–and that cheap, completely un-cool and un-designer kitchen appliance called the Crock Pot. P.S. After removing the soup bones, I threw in celery and carrot tops and some raggedy ends of Egyptian green onions and spring garlic. They’ll simmer a few hours to add even more goodness to the broth.